Impetus-PEF & Resurgo from Impetus-PEF on Vimeo. Impetus’ expertise has been truly revolutionary. Our partnership is helping create a robust platform to help more disadvantaged young people succeed in work. The need: Over 800,000 young people spend a year out of work, education or training with long term consequences for their employability, confidence and earnings. Our charity partner: Resurgo's award-winning Spear programme helps to get the most disengaged young people ready for work and into a job. Our impact: Resurgo has grown from a small west London project to a charity with eight centres across London. We helped them develop a strategy for growth while retaining a focus on delivering a high-quality programme. 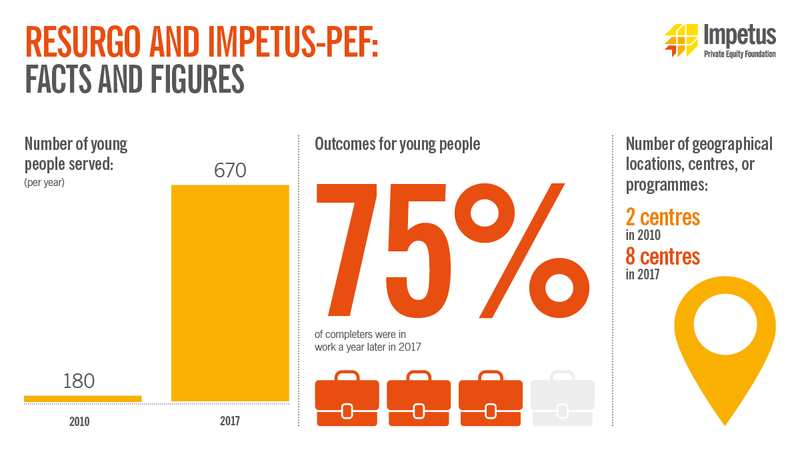 The number of young people in employment or training three months after completing Resurgo’s programme has improved by 20 percentage points since we started working with them.